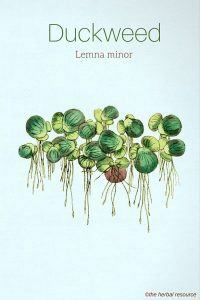 Botanical Name: Lemna minor L, Spirodela polyrhiza. In Chinese herbal medicine, greater duckweed (Spirodela polyrhiza) is often used interchangeably with common duckweed (Lemna minor). The two herbs are very similar in appearance and have the same medicinal properties. In Chinese herbal medical literature, they are often referred to under the same Chinese name “fu ping”. Other Common Names: Lesser duckweed, common duckweed, duckmeat, andemat (Norwegian), petite lentille d’eau (French), Kleine Wasserlinse (German), andmat (Swedish), lentejas de agua (Spanish), fu ping, qing ping (Chinese). Habitat: Duckweed grows in nutrient-rich and stagnant waters (puddles, ditches, and ponds). The species is widespread in many parts of the world, except in polar and tropical regions. The plant can become a troublesome weed in ponds, but it can easily be removed from the water surface. The plant material is an excellent addition to a compost. The plant is an important food source for both fish and birds and creates protection for wildlife below the water surface. Plant Description: Duckweed is a small aquatic perennial plant that grows in dense colonies floating on the surface. The plant is not divided into stalks and leaves but forms a flat, shiny and green discs. It produces several tiny roots. The minuscule flowers (male and female) are composed of two stamens and one fruit leaf and can be quite difficult to detect. During the summer months, the plant floats on the surface but sinks to the bottom in the fall and forms a turion (winter buds in aquatic species). It then rises to the surface when spring approaches. Plant Parts Used: The whole the plant is used in herbal medicine, either fresh or dried. The herb is collected during the summer months and dried in the sun. Active Ingredient and Substances: Duckweed contains substance like flavonoids (luteolin and apigenin glycosides), diterpenes, polysaccharides, tannins, vitamins B1, B2 and C and unsaturated fatty acids. It contains up to 45% protein and may, therefore, be of interest to bodybuilders and vegetarians. 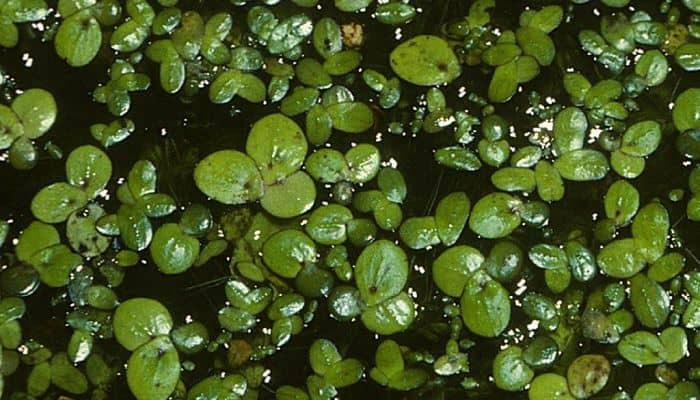 Three species of duckweed (Lemna minor, Lemna trisulca, and Spirodela polyrhiza) have all been used in western herbal medicine and as a food source. 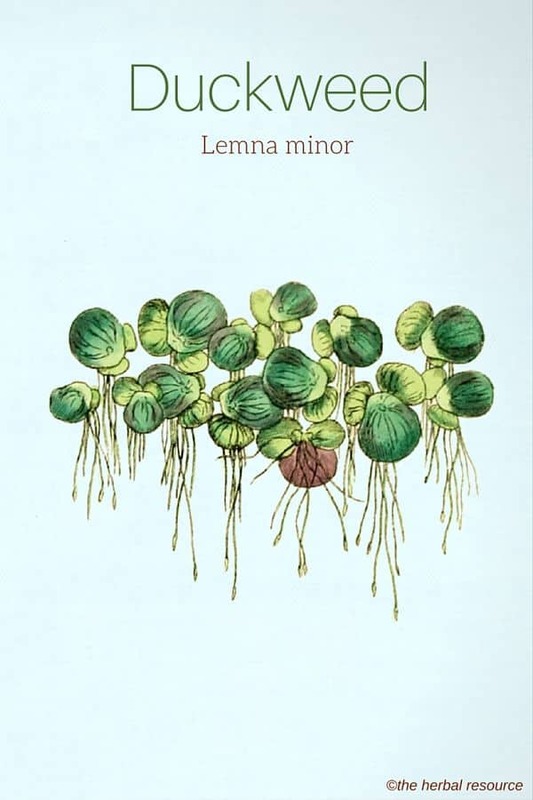 Since common duckweed (Lemna minor) is the most common, it is very likely it is the species referred to in earlier herbal literature. Pedanius Dioscorides (1st century AD) recommended duckweed against St. Anthony’s fire (Erysipelas). Henrik Smith (1495 – ca. 1563), a Danish humanist and a doctor, mentioned the herb in his writings where he writes that it can be used as a preventative measure against plague-like diseases. Simon Paulli (1603 – 1680), a Danish physician and naturalist, wrote that the herb could be used by women if they suffered from headaches due to overexposure to the sun. They should then enclose it in a linen cloth and place it on the forehead. Duckweed is considered to have an inflammatory and diuretic effect, which is partially due to the flavonoid content. Today it is used internally, often in combination with other medicinal herbs, to treat inflammation of the upper respiratory tract, and as a anti-inflammatory and blood purifying remedy for chronic rheumatic ailments such as rheumatoid arthritis and osteoarthritis (OA). Externally, it has been used to treat skin rashes, eczema, swellings and insect bites, usually in the form of a poultice. Duckweed has a sharp and rather bitter taste and in Chinese herbal medicine, it is regarded as a herb that possesses “cold energy” and induces perspiration and sweating. It is mainly used for ailments associated with the respiratory system and urinary tract system. In China, the herb is used internally for body temperature regulation (reduce high fever) and swellings (edema). 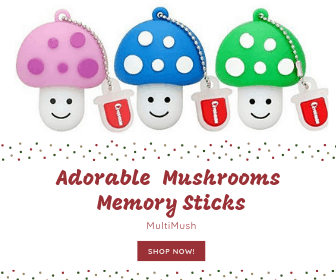 Externally it is applied as a remedy for various skin ailments, such as rash, eczema, measles, and insect bites. In Chinese herbal medicine, the herb is either used on its own or in combination with other herbs. Duckweed can be valuable as fodder for chickens. The herb contains high concentrations of calcium (10-25 g / kg dry weight), a mineral needed for hens to produce eggs. In addition, the herb has relatively high amounts xanthophylls and carotenoids that are partly responsible for the egg yolk’s orange-yellow color. Research is conducted on the possibilities of using duckweed as a protein-rich raw material for fish and animal feed, but also as a possible food source for people. As the plant can double its biomass within 16 hours, it is one of the fastest growing higher plants. The rapid growth, along with the plant’s high protein content, is of particular interest to genetic engineering and the pharmaceutical industry. Duckweed is also effective as a water purifier when it is grown in polluted water. As a decoction: Usual daily dose is 3.10 g herb for internal use. As a powder: 1-2 g daily for internal use. External uses: As much as needed. Duckweed is considered a safe herb to use and no serious side effect have been reported when it is used in therapeutic doses. If duckweed is to be used for human consumption, it should be noted that the herb contains relatively high amounts of calcium oxalate, a substance that can contribute to the formation of kidney stones. Duckweed can also accumulate toxins from the water it grows in, so it should not be collected from a highly contaminated water. Li, Thomas S. C.: Chinese and Related North American Herbs. Psychopharmacology and Therapeutic Values. Boca Raton, CRC Press 2002. Vermeulen, Frans: Concordant Materia Medica. Harlem. Emryss bv Publishers 2000.